The man credited with discovering the Beatles and who became the band's first manager has died at the age of 86. Allan Williams was also the original owner of Liverpool's Jacaranda Club. The Jacaranda tweeted: "Today our founder and the man who discovered the Beatles passed away. Allan Williams, you will be missed." Paul McCartney, John Lennon and Lennon's fellow art school student Stuart Sutcliffe were among the customers and they asked Williams if they could play at the club. Initially, he asked them to work on decorating the venue before allowing them on stage. But he parted company with John Lennon, Paul McCartney, George Harrison, Pete Best and Stuart Sutcliffe in 1961. The following January, the band - minus Sutcliffe - signed a five-year contract with Brian Epstein. In 2010, Williams told the Liverpool Echo: "I was just glad to have been there in the 60s, at the start of it all. "I've always been proud of The Beatles and proud and happy to have been just a small cog in the wheel of the most famous group in the world. "A lot of people have told me 'I would have loved to have been there' and it was a lot of fun - but we didn't know we were making history. "It was such a good time, though, and I've got no regrets - they were exciting days. But no-one knew The Beatles would go on to achieve what they did." In 2000, the book The Beatles Anthology included an interview with Sir Paul McCartney about those early days in which he recalled: "Allan Williams ran the Blue Angel and the Jacaranda. He was the little local manager. Little in height, that is - a little Welshman with a little high voice - a smashing bloke and a great motivator, though we used to take the mickey out of him." And in the same book, George Harrison told of the van ride to Hamburg: "We probably met with the van outside Allan Williams' club, the Jacaranda. There were the five of us and then Allan, his wife Beryl and Lord Woodbine [another local music promoter]. "It was cramped. The van didn't even have seats; we had to sit on our amplifiers. We drove down to Harwich and got the boat to the Hook of Holland." 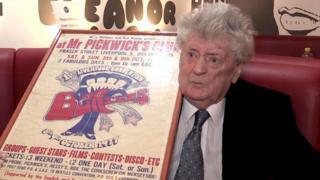 Liverpool's Cavern Club, where the Beatles made their name, tweeted: "We have just heard the very sad news about the passing of Allan Williams. Sincere condolences to his family at this difficult time." Williams' death comes after early Beatles promoter Sam Leach passed away shortly before Christmas.